It’s greenhouse time in Alberta! And what better time to run a webinar all about how to design and operate (and the benefits of) a passive solar greenhouse! Passive solar greenhouses are greenhouses that are primarily heated by the sun. No need for natural gas heating. You may occasionally need a space heater depending how cold it gets and how much thermal mass you have on the inside of the greenhouse (not sure what thermal mass is? Join our webinar and find out!). The webinar is perfect for current and aspiring CSA operators and market gardeners and just anyone who wants to reduce costs and their carbon footprint of home-grown vegetables. We recommend you listen to our Passive Solar Greenhouse podcast episode before you participate in the webinar. It’ll help fine tune your questions. The webinar will be led by Daniel Chappell, a professional horticulturalist and instructor at Olds College. Daniel is also a farm manager at Shirley’s Greenhouse in Didsbury and he has been grower for over 10 years. Daniel’s presentation will take approximately 20-30 minutes and then we’ll have 1.5 hours for Q&A and group discussion. Rural Routes to Climate Solutions events always have great group discussions. 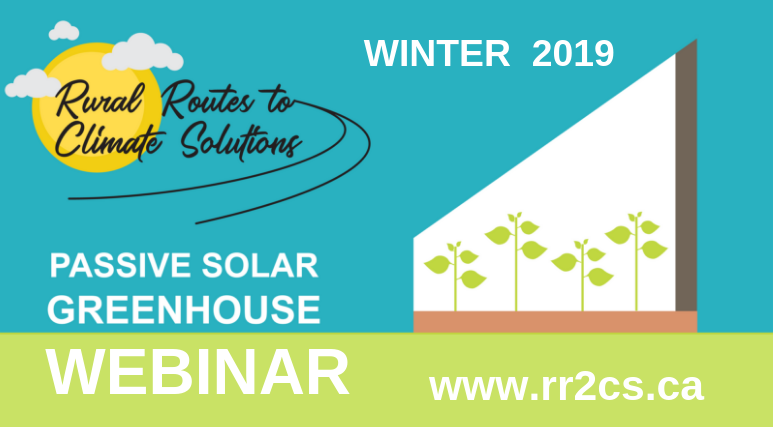 Participants of the webinar will also be invited to take part in a passive solar greenhouse tour on a farm in central Alberta to see passive solar greenhouse growing in action. Details on the tour will be released after the webinar.